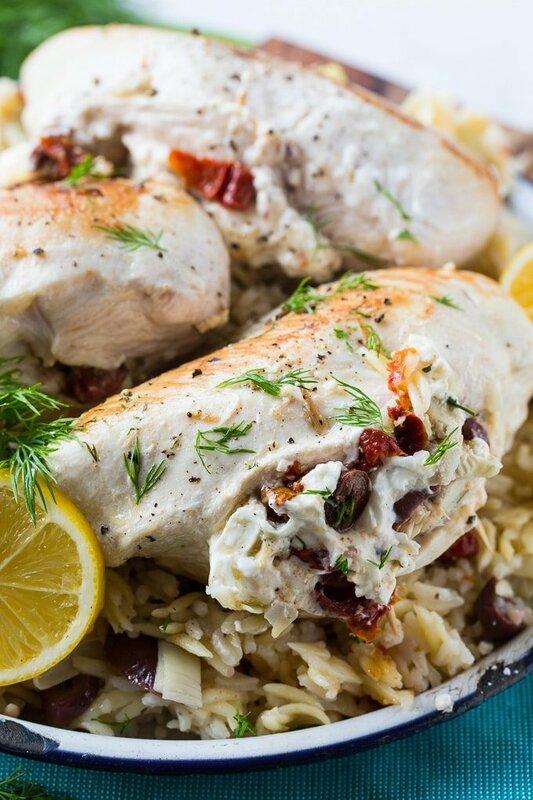 Greek Stuffed Chicken is stuffed with a creamy mixture of olives, sun-dried tomatoes, fresh dill, and artichoke hearts. Cream cheese and feta cheese help hold the filling together and they add so much creamy, cheese flavor. This is a dish you’ll want to eat all summer long. The flavors are so bright and fresh! You’ll want to cut the pockets in the chicken as big as you can so you can really get them stuffed with lots of yummy filling. There are so many flavors in this filling and you want to get as many of them as possible in each bite. It helps to secure the opening with a few toothpicks. And if some of the filling oozes out, it’s not the end of the world. It will get extra gooey and cheesy on the botom of the pan. I cook these Greek Stuffed Chicken Breasts in an oven-safe saute pan such as a stainless steel pan or a cast iron skillet. Sear them on both sides and then transfer the pan to a 350 degree oven to finish cooking the chicken. Serve over rice for a light, but rich and flavorful warm weather meal. 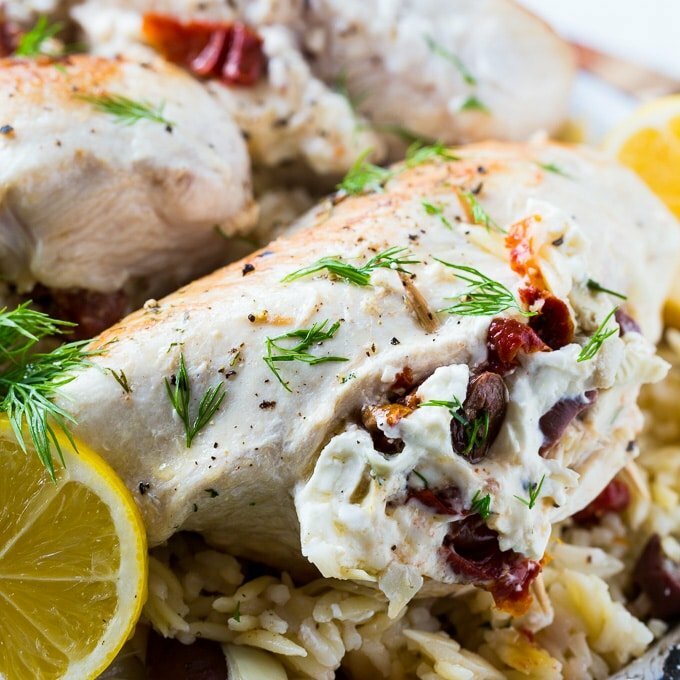 Greek Stuffed Chicken is stuffed with a creamy mixture of olives, sun-dried tomatoes, fresh dill, and artichoke hearts. Cream cheese and feta cheese help hold the filling together and they add so much creamy, cheese flavor. In a medium bowl, mix together cream cheese, feta cheese, lemon juice, garlic powder, oregano, and black pepper. Fold in dill, artichoke hearts, kalamata olives, and sun-dried tomatoes. Cut a pocket in each chicken breast. Season outside of chicken as well as inside the pocket with salt and pepper to taste. Stuff each pocket with cream cheese mixture and secure with a couple of toothpicks. Heat olive oil in an oven-safe pan (cast iron or stainless steal) over medium-high heat. Add chicken and cook until browned on bottom, flip over and brown on other side. Transfer pan to oven and bake 10 to 15 minutes or until cooked through. 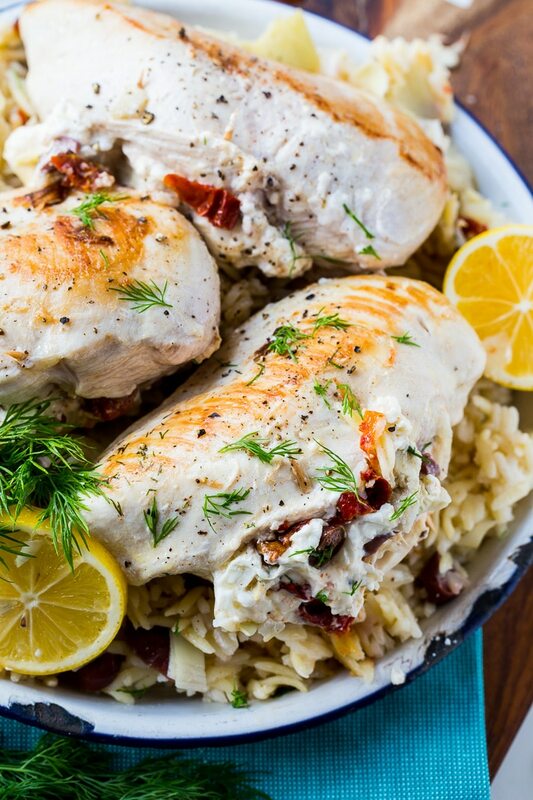 If you’re looking for a dessert that goes well with Greek Stuffed Chicken, try this Lemon Lush. Watch the video below to see how to make it. This entry was posted in Main Dishes and tagged chicken, poultry. Bookmark the permalink.